It's Pizza Party madness at your very own Play-Doh pizzeria! Make and deliver the silliest pizza pies you can imagine with all kinds of fun tools and squishy Play-Doh compound. Roll some imaginary pizza dough in the pan with the roller, grate a pile of make-believe mozzarella, and then add your favorite pretend toppings with the half-mold paddle. You can also use the grater to squeeze your own silly spaghetti dish. When you're ready, slice your Play-Doh pizza masterpiece, toss it in the box, and deliver to your friends! Includes pizza pan, half-mold paddle, pizza box, cheese grater, pizza server, rolling cutter, plastic knife, fork, plate, and 5 cans of Play-Doh Brand Modeling Compound. Ages 3 and up. It's Pizza Party madness at your very own Play-Doh pizzeria! Make and deliver the silliest pizza pies you can imagine with all kinds of fun tools and squishy Play-Doh compound. 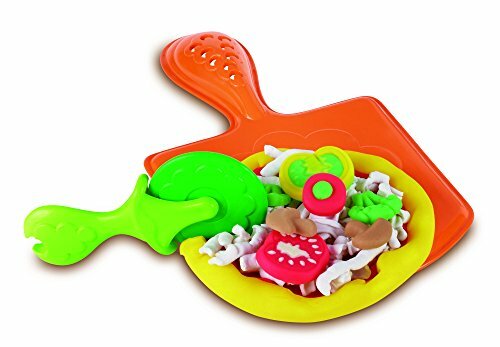 Roll some imaginary pizza dough in the pan with the roller, grate a pile of make-believe mozzarella, and then add your favorite pretend toppings with the half-mold paddle. You can also use the grater to squeeze your own silly spaghetti dish. When you're ready, slice your Play-Doh pizza masterpiece, toss it in the box, and deliver to your friends! View More In Clay & Dough.